BE SAFE. DONT LET THEM WIN. Worth every penny. 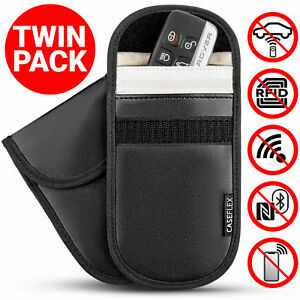 Great compact leather pouches with a special material which protects your debit/credit cards being copied or money taken. Also to keep your "plip" for your electronic start car. To stop robbers stealing your car.!! Protect your accounts and your property. Bought these for my wife, who has a car with keyless entry fob. When keys are in the blocker case inside her handbag, she can still operate the doors, so signal is not being sufficiently blocked. Since item is described as a 'signal blocker' and not a 'signal reducer' it is not effective. I'd have given 0 stars if I could. it does exactly what it claims to do. i have a keyless entry car and if i dont take the fob out of the pouch i can not get into my car let alone be able to start the engine.or use many of the cars functions. i keep my car fob in one and my bank cards in the other. i am now going to get two more for my wife to use. 2 pouches are supplied in one packet with simple instructions to insert key fob inside the gold lined pocket. When the flap is closed, the gold liner folds over to close the pocket. This completes the Faraday cage. I have both a volvo key fob and a similar size house alarm fob in the pouch with no size issues. I have positioned the pouch containing the key fob at the vehicle windows, doors and body panels, with the pouch closed and the car remains fully locked. Only when the pouch is opened and the top of the pocket exposed will the fob then open the car. The packaging says the pouch is made of leather and it looks to be so. It is smooth and will be able to be wiped clean. The flap is secured with a strip of 'velcro' and the seams are material taped and evenly sewn.